*Click on the right of the image to see the next photograph. Photographs by Renee Rosensteel. After seeing Market Square from a bird's-eye view, Dutch artist Allard van Hoorn decided that he wanted to turn Market Square into a record player for the 2016 Market Square Public Art installation. Van Hoorn's work incorporates the use of sound to explore and interpret urban landscapes. To include this aspect of his work into the installation, van Hoorn composed several tracks of music that were inspired by the sounds of seven community groups. 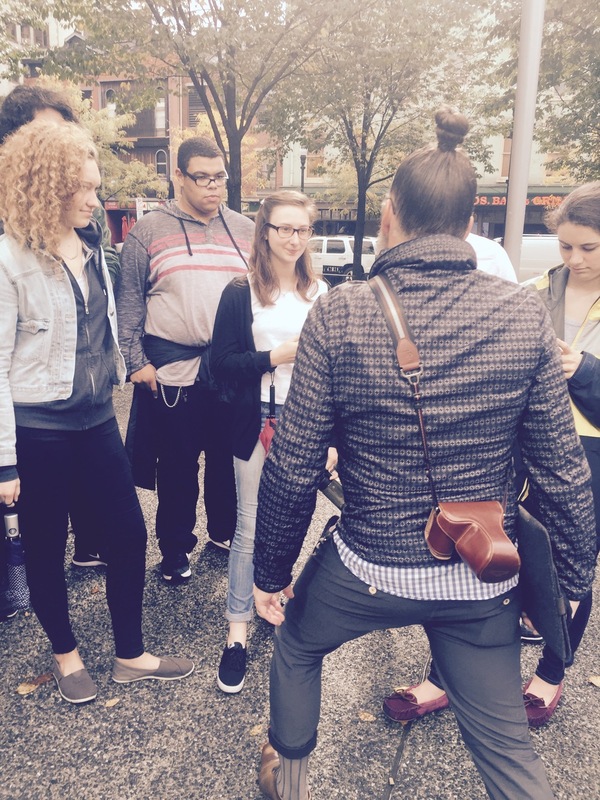 In October of 2015, van Hoorn met with student-poets from the Pittsburgh Creative and Performing Arts School (CAPA), tap dancers from Point Park University, steel drum players from Urban Pathways Charter School, members of the Downtown Clean Team, the Carnegie Library of Pittsburgh - Hazelwood, the organist from the First English Evangelical Lutheran Church, and Project Silk. Read the descriptions below to discover how van Hoorn included the sounds made by each group into the musical tracks. You can listen to the tracks on SoundCloud here. *Click on the right of each image to see the next photograph. Photographs provided by the Office of Public Art. 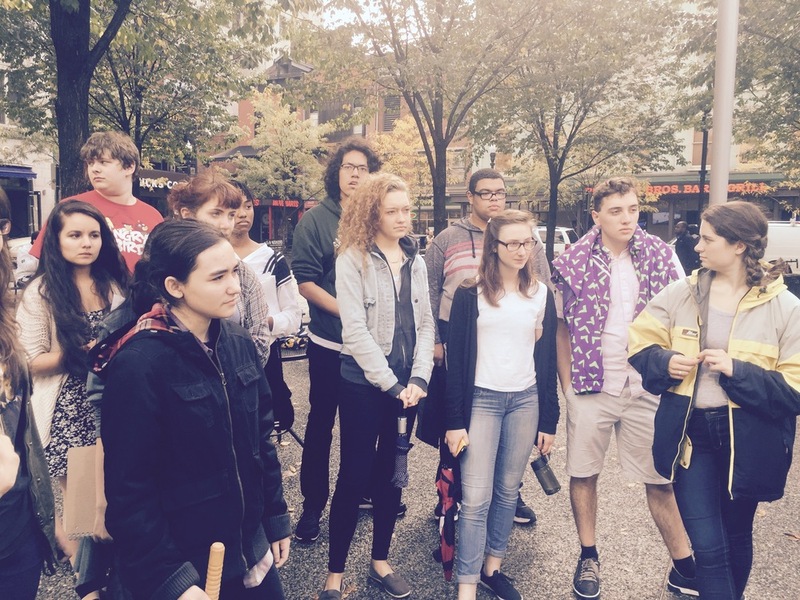 CAPA teachers Mara Cregan and Christa Romanosky had their senior poets recite short poems that the students wrote while observing activity in Market Square. Van Hoorn asked the students to stand in a spot on the outermost marking of one of Market Square's rings.The students recited their poetry repeatedly, experimenting with the intonation and inflection of their words and voices. Van Hoorn recorded the students' poetic sounds with a handheld digital voice recorder which served as the foundation for the track I Miss The Bees. Learn more about CAPA. Members of Downtown Pittsburgh's Clean Team descended on Market Square with brooms, rakes, garbage bags, and other tools. The Clean Team plays an integral role in keeping Market Square and the streets of Downtown clean. To showcase their important work, van Hoorn asked the Clean Team to sweep the Square in unison and to call each other using their two-way radios. The sounds produced by the Team were used to create the track 1099 on Fifth and Wood. 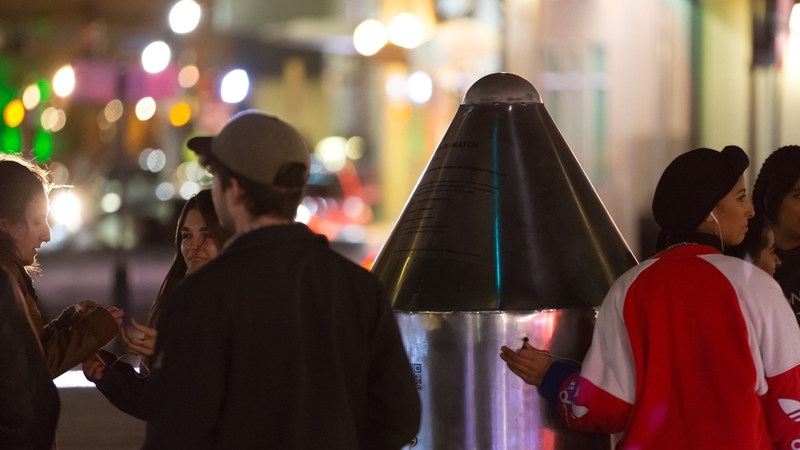 Learn more about the Pittsburgh Downtown Partnership’s Clean and Safe Program. Edith Abeyta is the artist-in-residence for the Artist in the Public Realm Residency Program at the Carnegie Library of Pittsburgh - Hazelwood. Abeyta came to Market Square with library staff and Hazelwood residents to make a drawing of the library with colorful duct tape directly in the Square. Van Hoorn recorded the sounds of tape ripping and the group talking to make the track Flower Beds. Learn more about Edith Abeyta’s work at the Carnegie Library of Pittsburgh - Hazelwood. Project Silk is an organization that supports minority gay men and transgender individuals. Many of the men that participate in Project Silk’s programming also vogue dance in the underground ballroom scene. Known as ball culture, dancers belong to various houses or chapters. The two biggest houses in Pittsburgh are the House of Revlon and the House of Ebony. Members from each house danced for van Hoorn in Market Square and their rhythmic clapping, hallmark call-outs, and dance sounds were used for the track Hey, Hey, Hey, Hey, Revlon. To learn more about Project Silk and their positive impact on young LGBT individuals, read this article from the Pittsburgh City Paper. Van Hoorn visited the First English Evangelical Lutheran Church and met with organist Cynthia Pock. Pock played notes from German hymns on the church’s pipe organ and rang the church’s bells. Van Hoorn recorded the sounds emitted from the organ and the ringing bells to create Open Now Thy Gates of Glory and The Long Calling. Learn more about the First English Evangelical Lutheran Church. Steel drum players from the Urban Pathways Charter School, along with their teacher Tracey Whorton, met van Hoorn on the Smithfield Street Bridge. The students arrived with various metal objects and proceeded to “play” the Bridge. From there, van Hoorn led the students to Market Square where they played their metal objects on various surfaces along the way. Steel Bridge Blues resulted from the sounds that the students created. Learn more about the Urban Pathways Charter School. Dancers from Point Park University tap-danced from Thayer Hall on Wood Street to Market Square. To protect their tap shoes, the students danced in a line on a row of wooden boards. As the line of students would reach the last board, a dancer on the sidelines would grab a board from the back and move it to the front so that the dancing was continuous. The track Tapping Down The Road captures this experience. Learn more about Point Park University. Watch a video of van Hoorn working with the groups. 1. '1099 on Fifth and Wood' (The Pittsburgh Downtown Partnership Clean Team) - 5' 47"
2. 'Tapping Down the Road' (Point Park University) - 5' 59"
3. 'I Miss the Bees' (Pittsburgh Creative and Performing Arts School) - 6' 43"
4. 'Hey, Hey, Hey, Hey, Revlon' (Project Silk) - 3' 42"
5. 'Open Now Thy Gates of Glory' (First English Evangelical Lutheran Church) - 6' 00"
6. 'The Long Calling' (First English Evangelical Lutheran Church) - 8' 00"
7. 'Steel Bridge Blues' (Urban Pathways Charter School) - 5' 54"
8. 'Flower Beds' (Carnegie Library of Pittsburgh - Hazelwood) - 4' 38"
You can listen to the tracks on SoundCloud. Click here to watch van Hoorn's artist talk in Pittsburgh. Click here to see a live, camera stream overlooking Market Square. You can now use the app to take pictures or to record yourself in the Square.